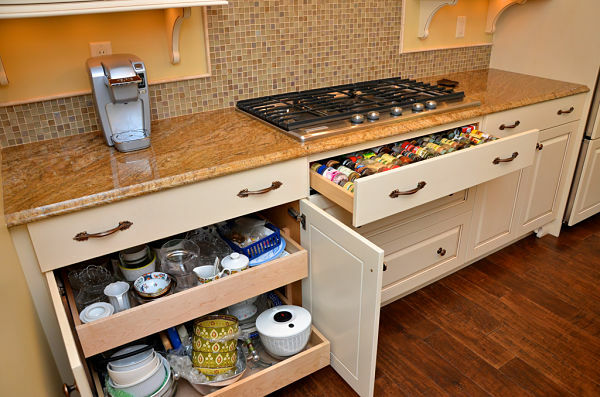 Storage is an issue we often discuss with people who are planning to remodel or update their kitchens. More of us are discovering the joy of cooking and there always seems to be new gadgets or food trends for home cooks that may influence how they plan storage. If you’re a Food Network fan, you’ve probably admired the organized kitchens on the sets of their top shows and some of the gizmos used by the chefs. From electric juicers and espresso makers to multiple sheet pans and pots for every purpose imaginable, they seem to have it all. Food Network star Ina Garten loves the utility of open shelves. When her kitchen was remodeled in 2009, the pantry and cooking area featured open shelves where contents were accessible. Her motto for kitchen design is to “keep it simple”. All of the items displayed on her shelves are white and chrome. Rachael Ray has a tiny kitchen in her New York apartment but open shelving and glass-door cupboards make it manageable. Glass-door cabinets can be lit to display contents and since the contents can be viewed, there is an incentive to keep items organized. The kitchen below is one we designed and illustrates how glassware, wine and collectibles are stored for function and decor. Hooks and narrow shelves can be installed on the back of a cabinet door to provide handy storage for items such as hand towels, pot scrubbers, dish soap and spices. 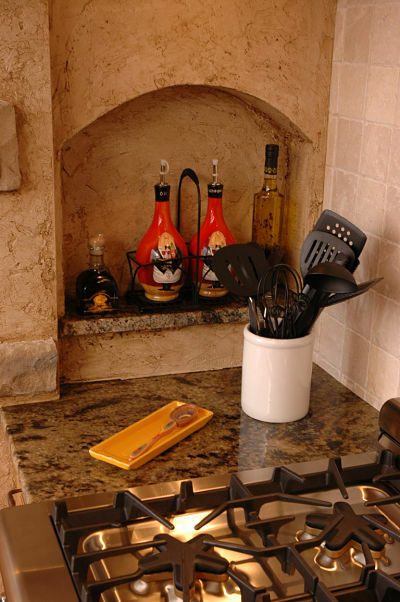 Built-in kitchen niches are a great place to store spices, oils and vinegars but can also be used for glassware, collectibles and cookbooks. 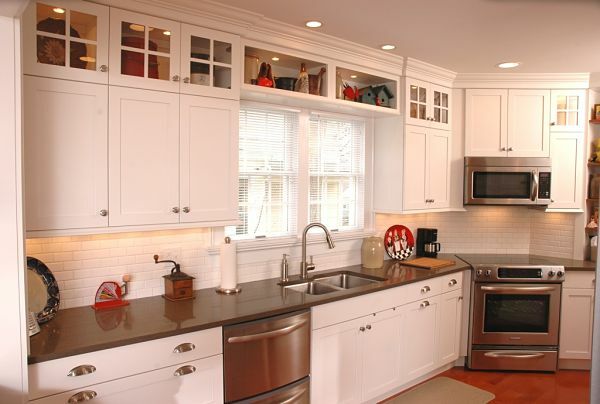 In chef Lidia Bastianich’s kitchen the counters are an important place for storing cooking items and small appliances. A toaster is tucked into a corner and colorful crocks hold utensils. A cutting board rests on the counter, while her blender is at hand. 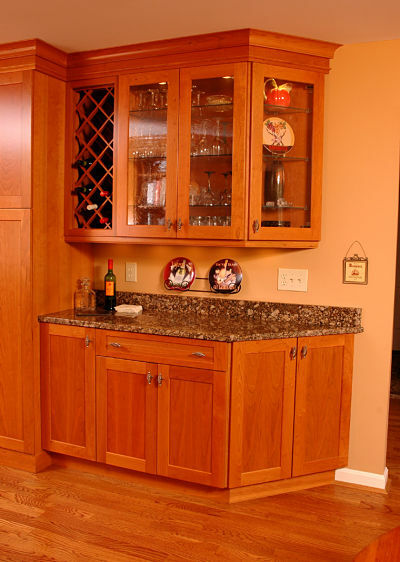 You can leave the space above a cabinet open for storage by omitting soffits from your design to store collectibles or infrequently used items that you may want to display. Hooks can provide a helpful solution for items you frequently use in the kitchen and need to have at-hand. Think about storing cups on hooks near a coffee a maker, potholders, utensils and other small items such as measuring cups and spoons or keys. There are many ways to optimize storage on a kitchen island, customized and determined by the way you cook in your kitchen and the amount of space in the room. 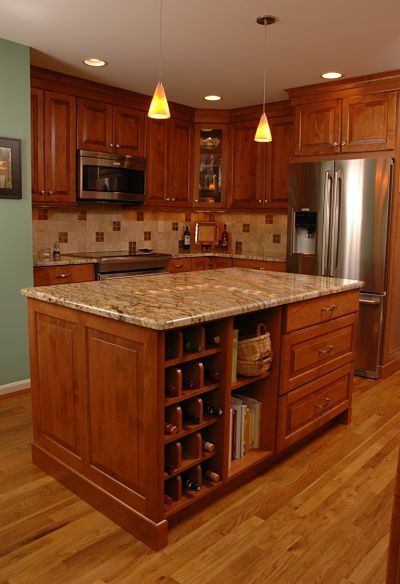 A kitchen island can be comprised of drawers and base cabinets or open storage. It can also be a place for small appliances, such as a microwave oven, or for a wine cooler or food storage. 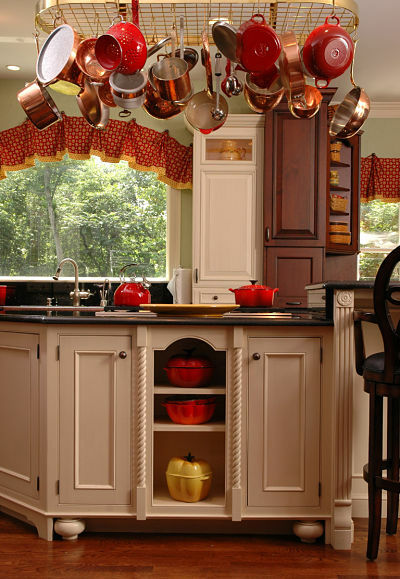 If you decide to use open shelving in your kitchen consider adding baskets. You can adjust the shelves to accommodate baskets that you can pull out to store items like root vegetables, linens or dry goods. If you’ve watched Paula Deen’s show you may have noticed that she has a rack of cooper pots hanging on the wall over her stove in her kitchen. She has the pots there both for aesthetics and for occasional use. Designer Mick DeGuilio created House Beautiful’s 2012 Kitchen of the Year and fashioned a pantry cupboard with hanging storage for pots with drawers below for the lids. Plate racks can be integrated with cabinets to provide convenient storage for dishes that you use every day. 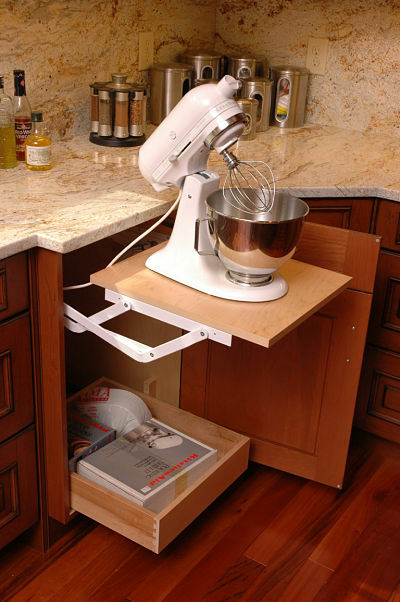 One of the most convenient options in today’s kitchens is pullout shelving. Gone are the days when you have to get on your hands and knees to reach into the back of a cabinet to find a pot, or move a half dozen items in a cupboard to locate the one you want. Toe-kick drawers are great for storing those sheet pans Food Network chefs recommend for almost everything roasted or baked and cutting boards, too. Mario Batali stores his kitchen string in ‘chef’s head’ string holders that his wife buys on EBay. Tin or metal cookie cutters are another hard to store item. If stored in jars, they can lose their shape and they tend to cause drawers to jam if stored there. An on-the-counter paper towel holder is a great solution. You can stack them or even use a couple to keep them organized for holiday use. When it comes to kitchen storage, don’t be afraid to think ‘outside of the box’ or talk with a designer about your needs. Seek ideas that simplify work in the kitchen.